A range of wash basin taps available with or without mixer. For cold and hot water connection. For public and semi-public areas. For installation in washbasin or work top. Not suitable for flow < 3 L/minute. Temperature pre-setting via below-desk mixer. Setting and interrogation option with Geberit Service Handy. 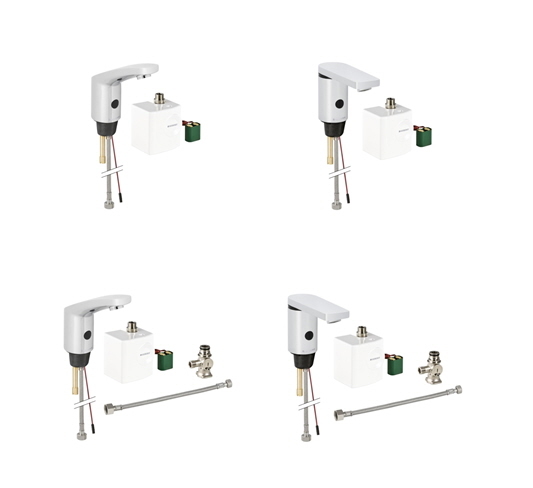 Flush actuation can be deactivated using Geberit Clean Handy. Volume flow control with aerator. Power supply from generator and rechargeable battery. Power supply, self-sufficient when used on average 20 times per day for a duration of four seconds each time, the basin mixer will work independently. Type 185, generator, without mixer. Type 185, generator, with below-desk mixer. Type 186, generator, without mixer. Type 186, generator, with below-desk mixer. Converting set generator for wash basin tap.